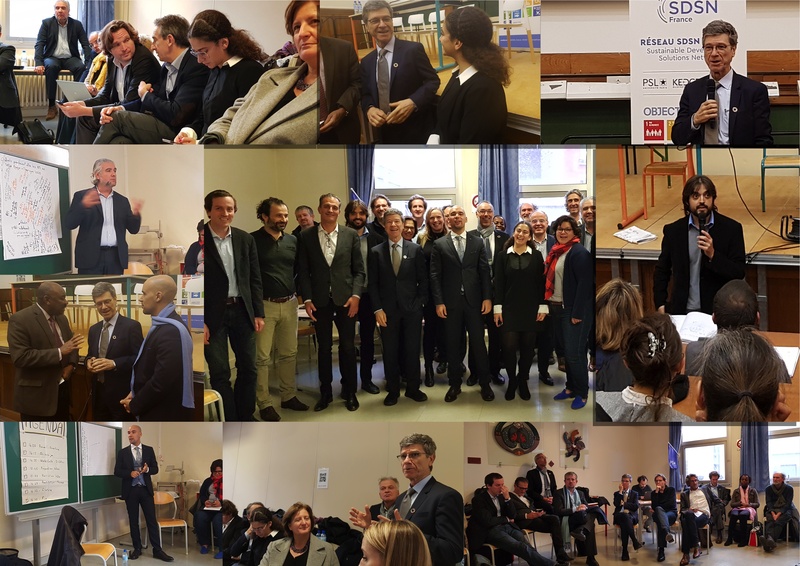 FEMISE was pleased to be part of SDSN-France launch in Paris on the 13th of November 2018. The UN Sustainable Development Solutions Network (SDSN) aims to gather a large number of leaders from all regions and diverse backgrounds in order to promote practical solutions for sustainable development, including the implementation of the Sustainable Development Goals (SDGs) and the Paris Climate Agreement. This network has been operating since 2012 under the auspices of the UN Secretary-General and bases its action on values of joint learning and integrated approaches towards interconnected economic, social, and environmental challenges. The launch of SDSN-France is a key event for the network in general because it allows it to have valuable partners form the academic and research field in France articulating the collaboration between multilateral actors and local financing institutions, the private sector, and civil society. The office of SDSN-France will be driven by KEDGE Business School, member of FEMISE network, the University of PSL, the Pierre et Marie Curie University and Cergy-Pontoise University. The event was extremely rich in presentations, forward-thinking discussions and proficient workshops. These workshops took the form of collective intelligence sessions where the diversity of the backgrounds of the participants allowed a broad understanding and holistic approaches to the issues discussed. Constantin Tsakas, Secretary General of FEMISE and General Manager of Institut de la Méditerranée, was a host in the workshop “Sustainable Finance”, organized by KEDGE Business School. Alternative and green financial tools were discussed during this workshop, along with determining the key objectives and responsibilities of the French branch of SDSN, as an unavoidable stakeholder in the debate of concretization of the SDGs. Questions brought up by Professor Jeffrey Sachs (Professor at Columbia University, special consultant UN Secretary General) such as the means by which the evaluation of projects in the context of systemic transformation can be possible or the standards to apply for ESGs (Environmental, Social and corporate Governance), pointed out the richness of this matter from a conceptual point of view but also the important practicality of this issue. In his recap of the workshop, Professor Thomas Lagoarde-Segot (Associate Professor of Economics and International Finance at KEDGE Business School and FEMISE researcher), stressed on the role of SDSN as a mediator between the different actors of Green Finance and more particularly as a gateway between the academic world and research, on the one hand, and the practitioners, on the other. An approach in 3 steps, that included FEMISE proposals, was retained by the participants: To achieve SDSN-France’s full potential, the network could act on 3 levels; the macro-level by raising awareness towards policy-makers, the meso-level by allowing the emergence and mapping of structures (financial, technical) that support social impact and on the micro-level by helping social entrepreneurs improve their perception of Green Finance and their access to it. These findings were then exposed during a plenary session with the presence of the SDSN-France board and will be included in the roadmap of this French branch of the network, under the section “Sustainable Finance”, alongside the other key findings of the different workshops tackling subjects as diverse and essential as “Education for Sustainable Development”, “Sustainable Cities”, “Sustainable Value Chains”, “Energetic transitions” and leads toward enhancing the “Solutions’ agenda” for SDGs in France. All of these workshops stressed the crucial role of SDSN-France as a facilitator of collaboration between stakeholders and of an accelerator of academic and intellectual effervescence towards finding practical and adequate solutions to concretize SDG goals. 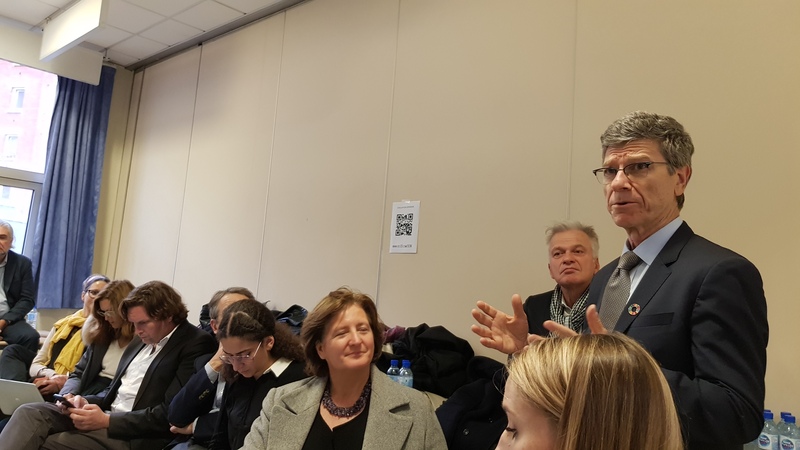 “Precipitating the change of the system as a whole” was one of the focal points of Professor Jeffrey Sachs during his keynote speech at the Chimie ParisTech. It is not about addressing each issue as an independent issue but about “kedging” the world towards change and towards cooperation and alternative ways of governing.